Mental Health Signs and Symptoms Surveys are utilised in Blu Ripples Intake Procedures for all counselling sessions, and as a basis for determining whether or not it is ethically appropriate to administer psychometric instruments to clients either as a stand-alone service or as part of a reporting project such as our Career Development Report. 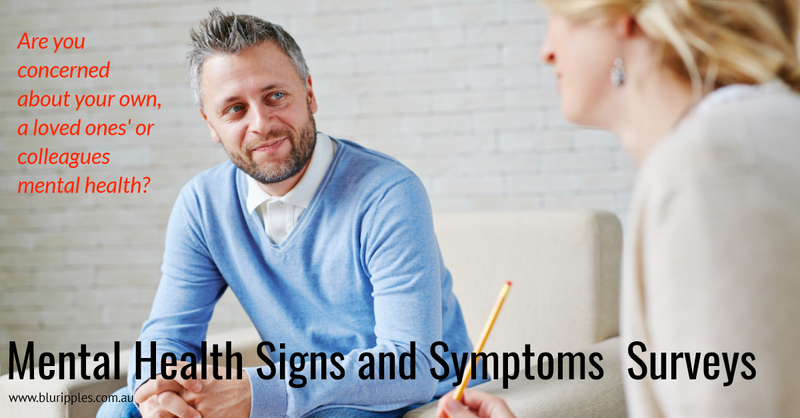 Please note that the term signs and symptoms survey refers to the identification of signs and symptoms of mental health conditions, that is the surveys are not a diagnostic tool rather a preliminary tool to identify whether a client presents with signs and symptoms of conditions that warrant further investigation prior to undertaking additional services and/or psychometric instrumentation assessment. Should a client present with moderate or higher signs and symptoms of one or more mental health conditions Blu Ripples will refer the client to their GP for diagnostic assessment prior to proceeding with any other services to ensure the client general health and well-being and that Blu Ripples adhere to ethical administration guidelines.